The University of Notre Dame is made up of one school, Architecture, and four colleges, Arts and Letters, Business, Engineering, and Science. Each of these units in turn is made up of departments that offer majors. To rightfully say that you are a “Domer,” you must successfully complete the University's core curriculum in addition to completing the requirements of a particular major. Architecture, Arts and Letters, Business, Engineering, and Science also have college requirements that must be completed before a student can be awarded a bachelor of architecture, bachelor of arts, bachelor of fine arts, bachelor of business administration, bachelor of science in engineering, or bachelor of science degree. Departmental requirements are what define your major; these are often referred to as major or program requirements. Course attributes are codes used to categorize courses for the fulfillment of academic requirements. They are listed in NOVO and identified in our course descriptions. These codes will help you understand how a course applies to what you must complete in order to graduate. 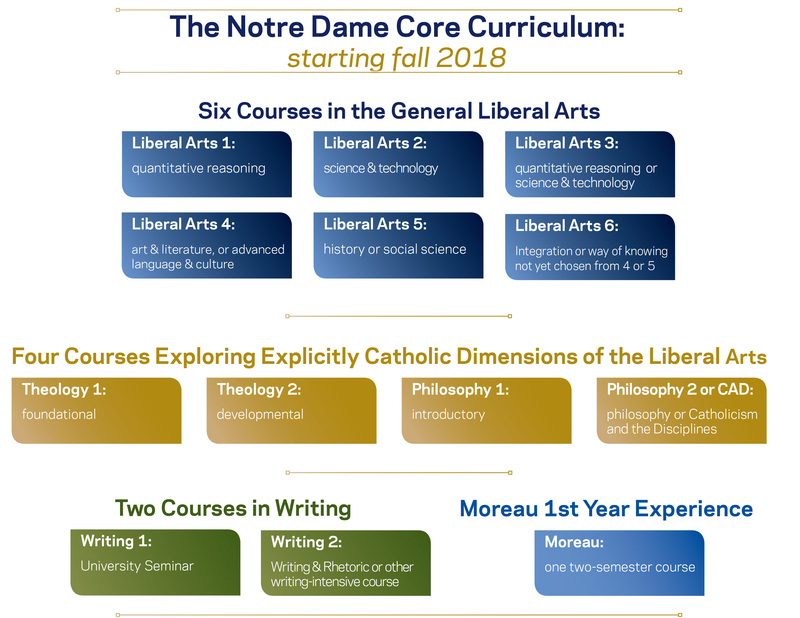 In order to graduate from Notre Dame, all students must complete the University Requirements that define our liberal arts curriculum; the specific college requirements unique to the school or college in which they purse a major; and the major or program requirements for the major they declare. Students also need elective courses, those not required by the university, the college or the major, in order to have enough credit hours for graduation. At the end of your first year with us, you will formally declare your college. In the case of the school of Architecture, all students pursue the same degree; in the case of the College of Science and Engineering, you will declare a major at the end of your first year; in the case of the College of Arts & Letters, you may declare a major at the end of your first year or until the end of your second year; and in the case of the Mendoza College of Business, you will declare you major in your second year. Minors are optional secondary fields of study that provide the means to pursue interests that fall outside your major field of study. A minor usually requires five courses, but requirements vary. Many minors are interdisciplinary in nature. Some minors are available through Notre Dame’s Centers and Institutes, so you may also want to become familiar with those programs. Some majors allow for concentrations, but not all. Concentrations usually require the completion of three courses recognized by your college and department and can indicate an additional area of specialization in your undergraduate degree. Some students may find that the dual degree option best suits their needs. A dual degree allows you to complete two undergraduate degrees in different colleges. These programs generally require five years to complete. You must complete all of the university requirements, all of the requirements for both colleges, all of the requirements for both majors, and the total number of degree credits specified for a dual degree in the two colleges. While the total number of hours required does depend on the two major programs, the minimum required total number of degree credits is set to be 30 degree credits beyond the college total for the college with the greatest required number of degree credits. Dual degree programs are available in Arts and Letters with Engineering and Science with Engineering. Electives are optional courses that may not satisfy the requirements of the University, your college, or your department. The number of elective courses you can take varies depending on your future school or college, ranging from 0 to 36 credit hours. You should use electives as an opportunity to look more deeply into an interest that you already have, or to explore new intellectual territory that may lead you to new abilities and interests. Notre Dame is committed to providing opportunities for students to put their faith and values into action and to learn about social issues from first-hand experience. Not only do many colleges and departments offer service learning options, but you will find a wide variety of seminars and programs available through the Center for Social Concerns at socialconcerns.nd.edu. Notre Dame students may spend an academic year, a semester, or a summer of study in one of over 40 programs around the world. For a complete list, see studyabroad.nd.edu. It takes careful planning to participate in one of the study abroad programs without delaying graduation or limiting choice of major. If you select a program, plan your curriculum in consultation with your First Year advisor.